Others included former beauty pageant winners Aishwarya Rai and Nicole Faria -- mountaineer Bachendri Pal, Anshu Jamsenpa, missile woman Tessy Thomas, private detective Rajani Pandit and more. NEW DELHI: It was beyond the dreams of Manju, the first woman coolie from Rajasthan, that her compulsion of breaking the male bastion to earn livelihood would land her in the Rashtrapati Bhavan in the company of Aishrwarya Rai Bachchan and over 90 other woman achievers. When Manju, porter number 15 at the Jaipur railway station, narrated the circumstances in which she had to take a profession where only men worked even President Ram Nath Kovind got sentimental. "I weighed 30 kilograms and the passengers' luggage was also 30 kgs but it was nowhere to the burden of feeding three children. After the death of my husband, I had to feed them. My brother asked me to come to Jaipur and look for something," Manju said addressing the gathering of women achievers at Rashtrapati Bhavan today. She said the authorities initially told her there were no women porters and hence it would be difficult for her. But she persisted and eventually given the badge number 15 of her husband, who was also a coolie. Manju said she was illiterate and did not know how the platforms are numbered so she had to depend on passengers and fellow porters to locate coaches and seats. "I told the authorities about my difficulties. They trained me for six months and gradually I picked up," she said. After hearing her story and stories of some other woman achievers, the President said every one in the gathering has a story to tell. "I never get so emotional easily but after hearing the story of our daughter Manju, I have become...." Manju was the first woman for the entire North Western Railway region to take up the job of a "coolie" (porter). She started working at the Jaipur railway station in 2013. The ceremony witnessed a gathering of over 90 pioneering women from different backgrounds. Among 112 women who were felicitated by the Ministry of Women and Child Development, besides the Rajasthan porter, there were former beauty queens -- Aishwarya Rai and Nicole Faria -- mountaineer Bachendri Pal, Anshu Jamsenpa, missile woman Tessy Thomas, private detective Rajani Pandit and Chhavi Rajawat, who gave up her corporate job to become the sarpanch of her village. Paralympic medalist Deepa Malik, Naina Lal Kidwai, who has many firsts to her credit including the first head of FICCI the first woman head of any International bank in India were, also awarded. 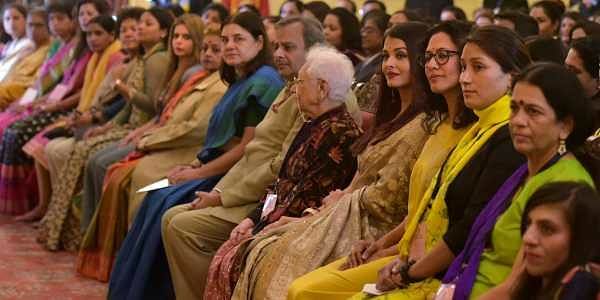 "These women achievers 'first ladies' are those who are first to set a milestone in their respective fields like the first female Merchant Navy Captain, first train driver of passenger train, first female firefighter, first female bus driver, first Indian woman to reach Antarctica among others," a statement from the ministry said. Over 90 of them came to the Rashtrapati Bhavan to meet the President here today. Citing the example of Rajawat, an MBA graduate who was elected as the sarpach of Soda village in Rajasthan, Kovind said if women think to start from villages, it will change the entire country. Another achiever who found mention in the President's speech was Rajani Pandit, the first women private detective in the country. Her interesting stories about her experiences as private investigators left the audience in splits. "When I started people asked why couldn't I find a better employment. Why was I trying to break families," she said adding that in last 25 years she has solved 75,000 cases. Kovind lauded the efforts of Ira Singhal who topped the coveted civil services examination in 2015 overcoming her disabilities, becoming the first differently abled person to achieve the feet. "No one can imaging that any physically disabled person would top the IAS and allied services examination. I would appreciate the government officials too who helped her," he said. He said the efforts of the government towards women empowerment are now showing result. "I have been told that 30 crore accounts were opened under the Jan Dhan Scheme in which 52 per cent are of women," he said, but cautioned that violence against women remains a cause of concern. He said when given an opportunity, women achieve remarkable success. In our country, women are gracing the positions of governor, union ministers, judges of the Supreme court. All gathered here are inspiration to the women of the country, he said. On the issue of women safety, he said, "...due to prejudiced mindsets, women are still victims of violence. They need to feel secure in public places, and this should be a matter of concern for all of us. Along with the government, it is the responsibility of every section of society." He said the government and the society will have to work together to ensure safety of women. Kovind said it is important that women have equal rights as men.